Jeff Bezos, the owner and CEO of Amazon, accused the National Enquirer of extortion and blackmail on Thursday. He alleged that its parent company, American Media Inc., threatened to publish text messages and intimate images if Bezos did not stop his investigation into the company. His claims of blackmail and extortion were backed by journalist Ronan Farrow, who took to Twitter on Thursday to say he and another journalist were also targeted by AMI. He wrote, AMI threatened to ruin them if they did not stop their investigation. Farrow wrote and published a story in the New Yorker in April 2018 about David Pecker, the chairman and CEO of AMI, and his friendship with President Donald Trump, which said the tabloid bought and buried stories to help Trump’s 2016 presidential campaign. AMI also allegedly entered into an immunity deal with the Department of Justice about the “catch and kill” process. 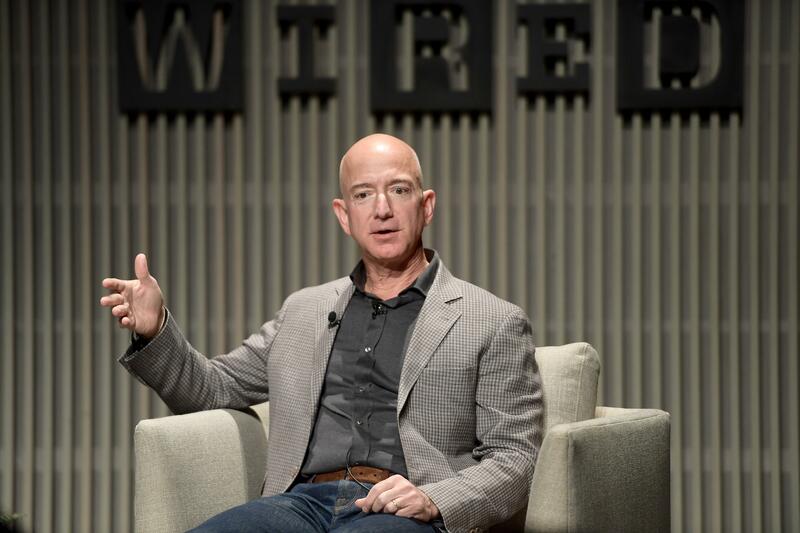 Bezos who also owns the Washington Post said he began investigating the publication after they published a story about him and his relationship with former TV anchor Lauren Sanchez. They also included his personal text messages and pictures in the report. On Thursday, Bezos wrote a post on the website Medium.com where he shared the emails AMI executives had sent him, threatening to leak his and Sanchez’s photos if he didn’t stop the investigation. He also wrote that the Enquirer wanted him and his security consultant to make a false statement that neither of them has any knowledge or basis to suggest the coverage by AMI was influenced by any political forces. He also added that he and his team was first approached verbally by the company with the same threats of leaking his pictures and text messages. While his lawyers argued that AMI had no right to publish the photos since Bezos himself holds the rights over them and that they were not newsworthy, AMI claimed the newsworthiness was that the photos would show the shareholders of Amazon that Bezos had terrible business judgment. Though the other journalist Farrow mentioned about in his tweet didn't speak yet, several other journalists had in the past said that they too were threatened by the National Enquirer for investigating the tabloid. These included journalist and Associated Press editor Ted Bridis who said he was warned that AMI had hired private investigators to dig into the backgrounds of AP journalists investigating the tabloid and its connections with Trump. The association between Trump and the National Enquirer was scrutinized a number of times by several media outlets in the light of the friendship between Trump and Pecker. Pecker ensured that his publication only wrote favorable stories about Trump and the company also admitted to have paid $150,000 to a woman, who allegedly had an affair with Trump, as hush money so as not to impact the election. This came after federal prosecutors reached an agreement with the company in December that they would not prosecute the company if they admitted to paying the woman off as a way to influence the elections.